Upon wrapping up most of a week with family and friends celebrating the marriages of not one but two great couples we set off for North Carolina. For a wedding. 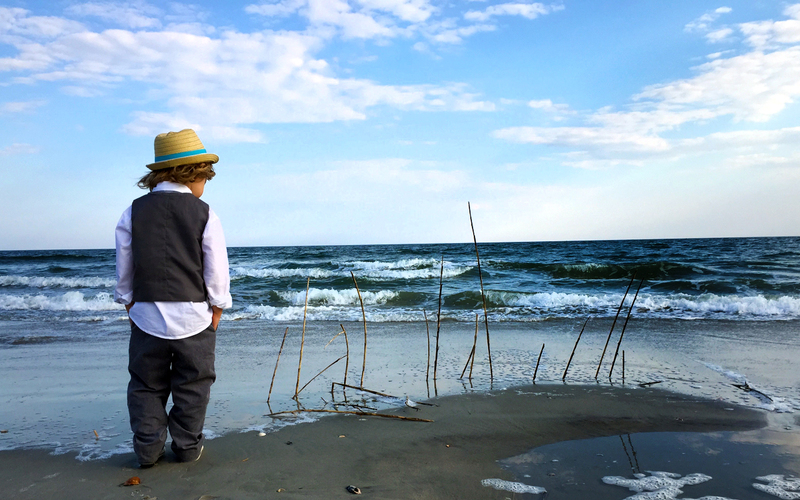 We had a pretty well laid out plan that would lead us to coastal North Carolina, then north through the Outer Banks, Assateague Island (there are wild horses there), and eventually Brooklyn, NY before heading back to Ohio. This is how it all shook out. 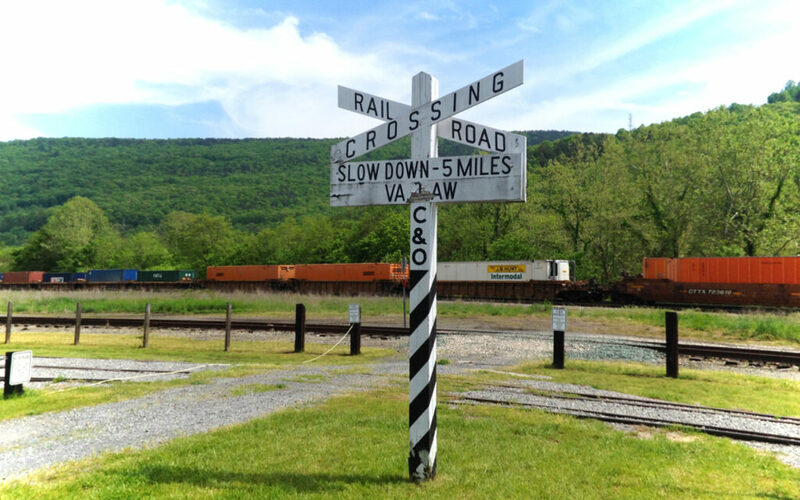 We set out from Dayton with plans to camp somewhere in or near the George Washington/ Jefferson National Forest which more or less straddles the length of the border between Virginia and West Virginia. We tend to plan pretty loosely partially because there aren’t many things more frustrating than having a well organized plan fall to pieces because of this, that or the other. Also because we tend to get waylaid by the possibility of a more scenic route, a waterfall, an interesting sounding geocache, a skatepark, Townes’ penchant for picnics and the prerequisite picnic-worthy locale, and a host of other intriguing pitstop worthy attractions that keep us from hurtling down the interstate to a timely arrival at our destination. With rainstorms in the forecast we turned to Airbnb in order to secure shelter for the night that wouldn’t cost more than what we’d planned to pay for camping, which ranged from zero to eleven dollars. 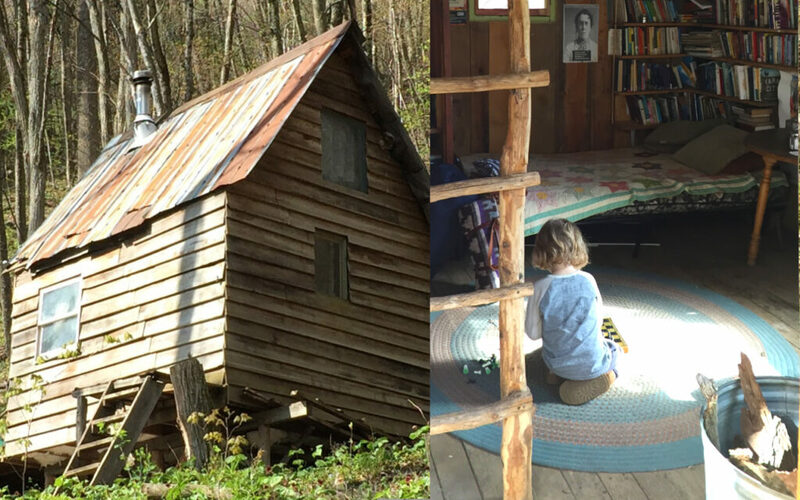 It was our good fortune to find an off grid one room cabin on a permaculture farm nestled deep in a holler in the Blue Ridge Mountains. Due to our aforementioned travel tendencies and increased distance we arrived at Woodland Harvest Farm well after dark. Our hosts had thoughtfully lit the wood stove to take the dampness out of the rainy mountain air and we settled in for the night, the room lit by oil lantern, and the path to the outhouse lit by flashlight. Off Grid cabin at Woodland Harvest Mountain Farm. Sunlight in the morning introduced us to the beautiful piece of land we couldn’t appreciate in the dark the night before. The small stream we’d crossed over in order to get to the cabin the night before cascades through the valley of the 16 acre farm, producing electricity for the farmhouse by way of a micro hydroelectric generator. The cabin we stayed in is about 12′ x 12′ with a lofted space reached by a handmade (this may be redundant given that the entire structure was built by hand) wooden ladder, two walls lined floor to ceiling with books ranging from identifying local flora to passive resistance. We spent the morning hiking around the property, swinging on a tire swing, and Townes paddled a kayak around the pond. The road called and we needed to get onward to my cousin’s wedding on Holden Island so we packed out and were headed for the coast. 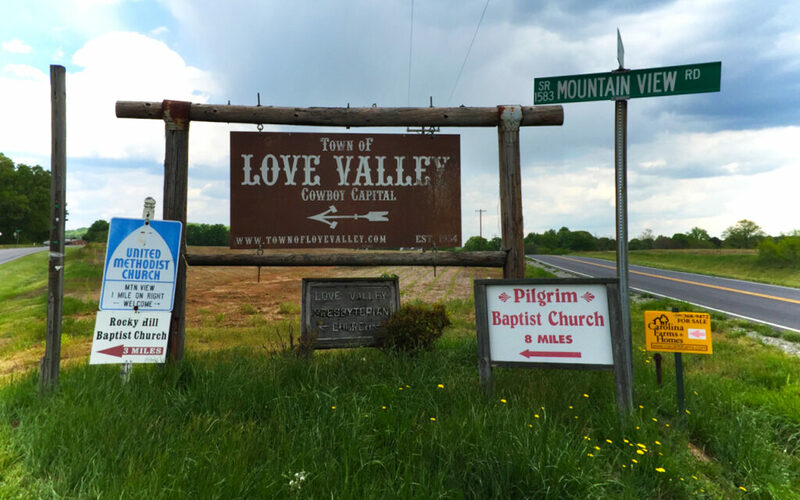 And then we discovered Love Valley. It’s real. And only people and horses are allowed on the main street. 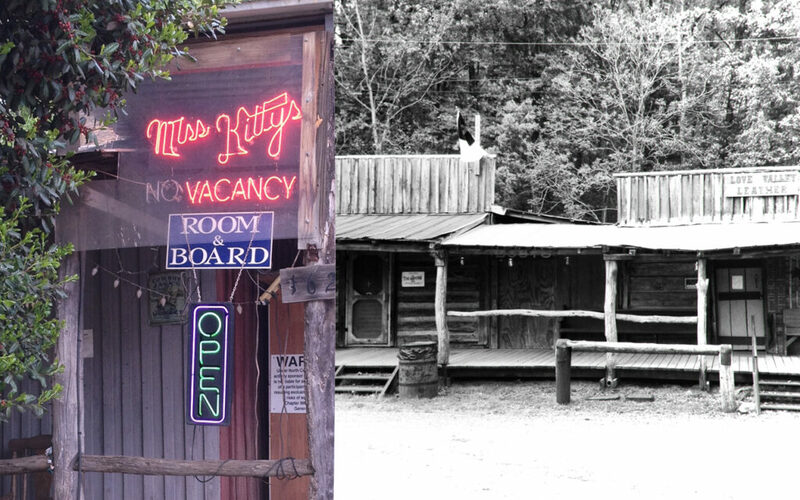 There’s a saloon and a hotel called Miss Kitty’s. 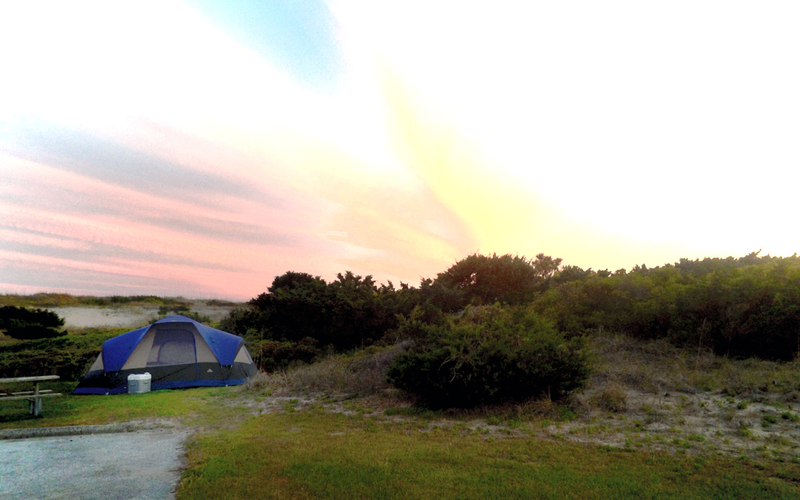 After spending the weekend with family for the wedding, we headed north up the coast toward the Shackleford Banks (there are wild horses there) or Cape Lookout, intending to take a vehicle ferry to an island where camping is free and on the beach. 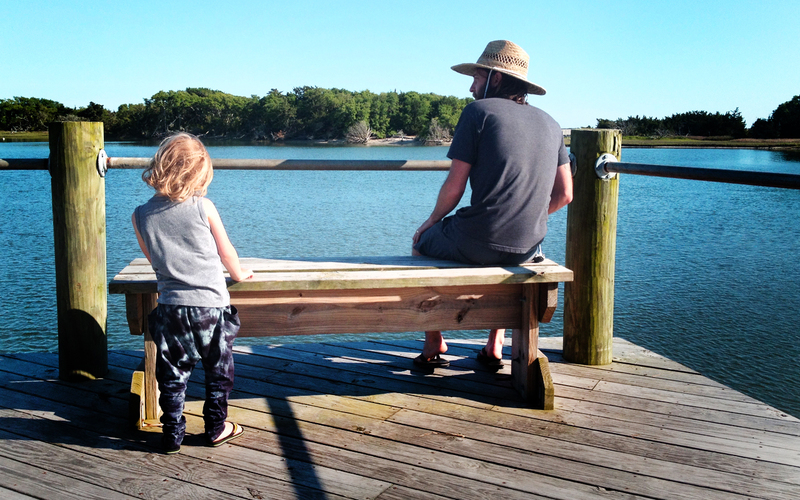 Upon speaking with a ranger at the NPS station in Beaufort, NC we realized that we’d missed the last ferry of the day to Cape Lookout, not to mention that the eighty five dollar fare each way was out of our league. 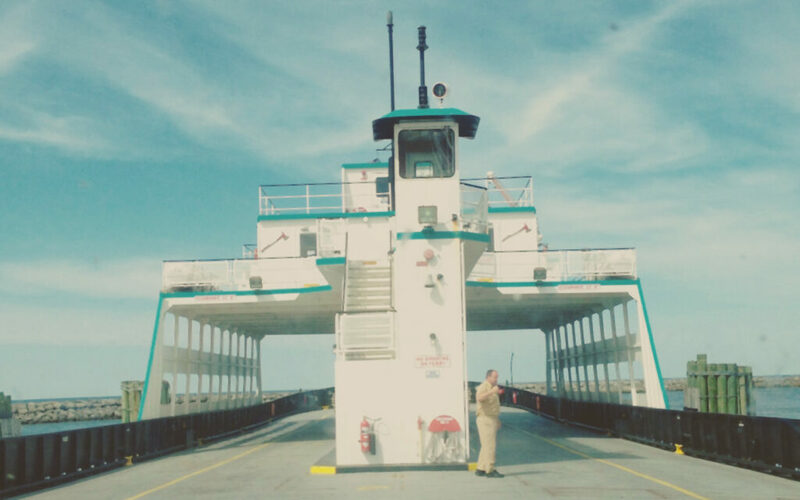 We could have hopped a privately run people ferry to the Shackleford Banks right out of Beaufort but we’re not set up for hauling gear without the help of our vehicle. We picnicked, sought out a few geocaches, checked out the town, and reevaluated. While looking into options for camping at points north, a high school friend of Renae’s reached out and offered us her backyard. 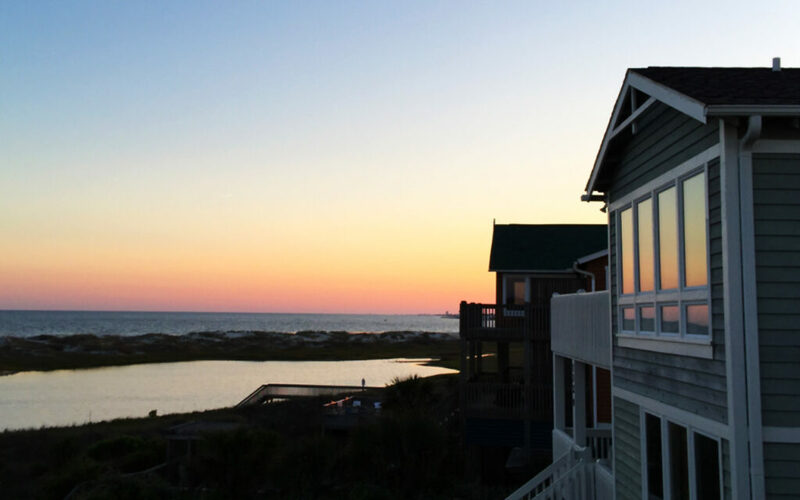 So we headed south to Emerald Isle and had a great evening getting to (re)know a friend. 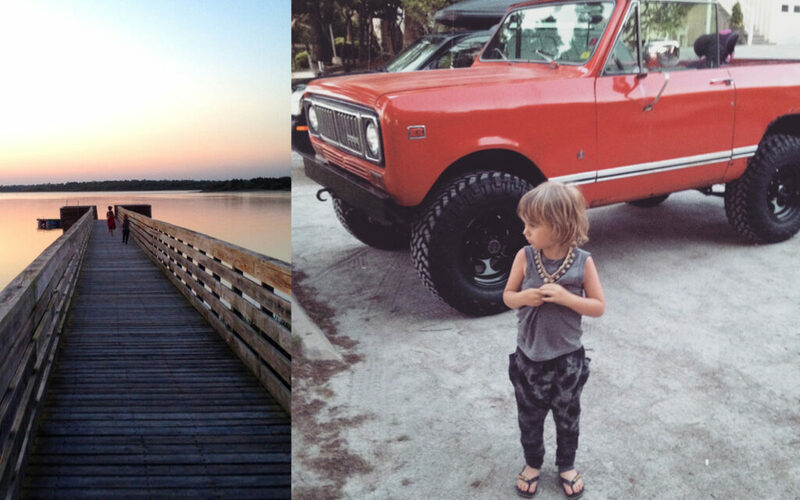 She and her husband happen to own an International Scout so Townes got to have his first ride in a real truck, top off, to watch the sun set over the intracoastal. And on we went. Having learned the night before that we had been mere blocks from a house in which Edward Teach, Blackbeard himself had lived, we headed back to Beaufort for a flyby of some pirate history. 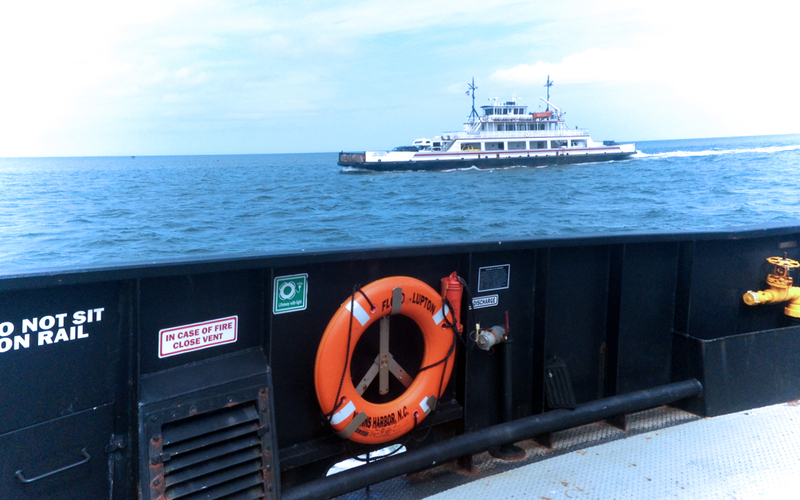 Onward to Cedar Island and the two hour ferry ride to Ocracoke. 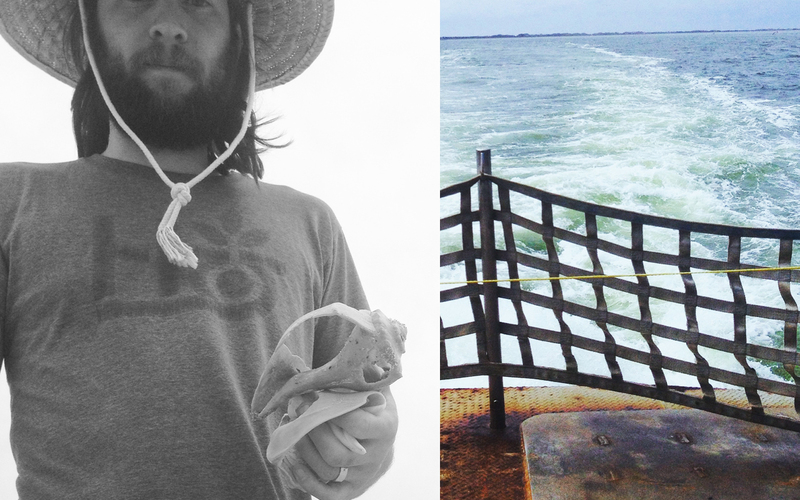 The ferry ride across Pamlico Sound to Ocracoke is an experience in itself, but disembarking on the island is nothing short of surreal. The waters known as The Graveyard of the Atlantic create an undeniable mystique and the island and it’s village compliment it well. A short drive through town and four miles north brought us to the NPS campground. Twenty three dollars a night bought us a site with access to cold showers, little to no shade, and not but a dune between our tent and the ocean. Townes and Renae were over the dune and on the beach before I even had the ground cover staked down. They set to exploring while I set up camp, taking some extra time to reinforce the fly against fairly strong onshore wind, which was fine as it helped against the mosquitoes. In short order camp was set and I was headed a couple miles back to town for charcoal, having learned that open fires aren’t allowed and for good reason. I would not want to be responsible for the island dissolving into the sea after burning off all the sea oats. I returned to camp with charcoal, which served a decent enough substitute for marshmallow roasting, as Townes had been counting on S’mores for more than a few days. 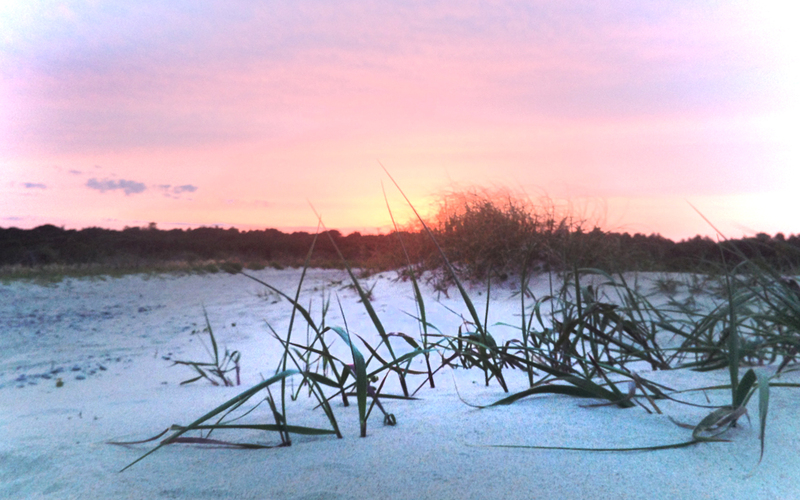 We awoke the next morning to beautiful skies and the promise of the wild horses of Assateague 250 miles and a ferry ride to the north. As it has been said however, even wild horses couldn’t drag us away. We felt as though we’d stumbled upon an island with both fists full of adventure still hidden behind it’s back and although the pull of wild horses and Brooklyn beyond were strong, we weren’t ready to leave. Another twenty three bucks and the campsite was ours for another night. The horses will be there for another day. We didn’t regret our decision. 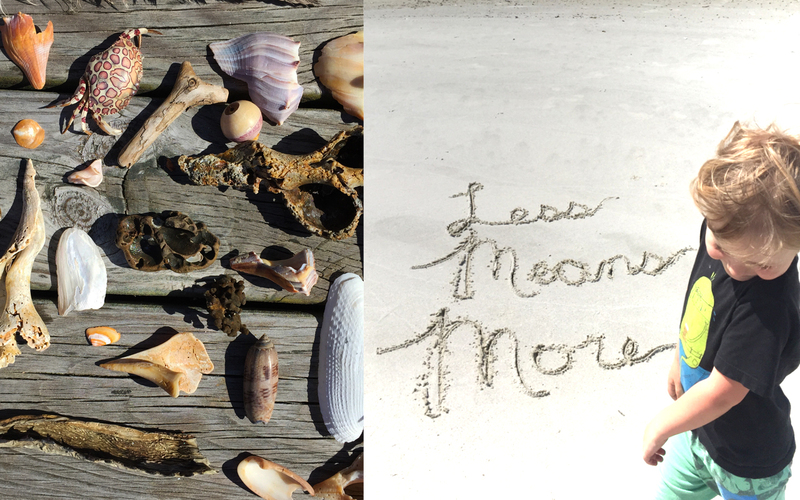 We spent the day collecting shells, exploring the village (we logged a geocache at the site of a head on collision between the first, and only, two cars on the island circa 1925), finding a nearly six foot shark on the beach (sad), and squeezing all the adventure we could out of the day. S’mores over charcoal, a second round of tacos from Eduardo’s food truck (don’t waste a good thing) and a star lit walk on the beach ended the evening. Heavy storms on the horizon had us packing out quickly and heading north to the ferry that would take us to Hatteras and eventually the mainland. 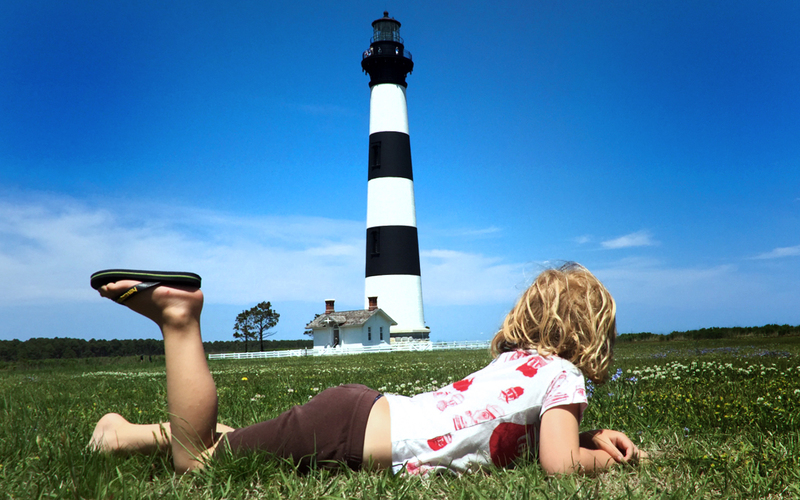 It’s a much shorter ferry heading north off the island but the maze of shoals and shifting sand islands make for an intriguing and seemingly more adventurous trip to Hatteras. 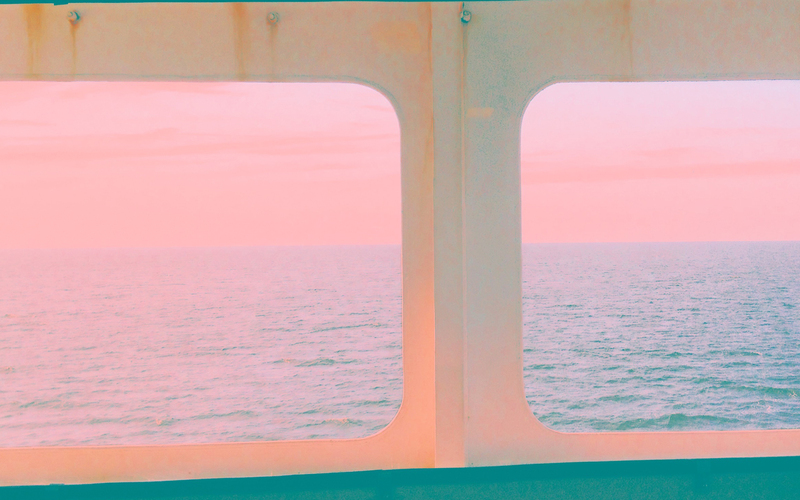 After spending some minutes trying to identify the shapes and colors I was watching in the distance out towards open water, I dropped a quarter into the viewfinder on the second deck and was astounded by the largest and angriest waves I’ve ever seen, crashing over what must be a sandbar in the channel between islands. 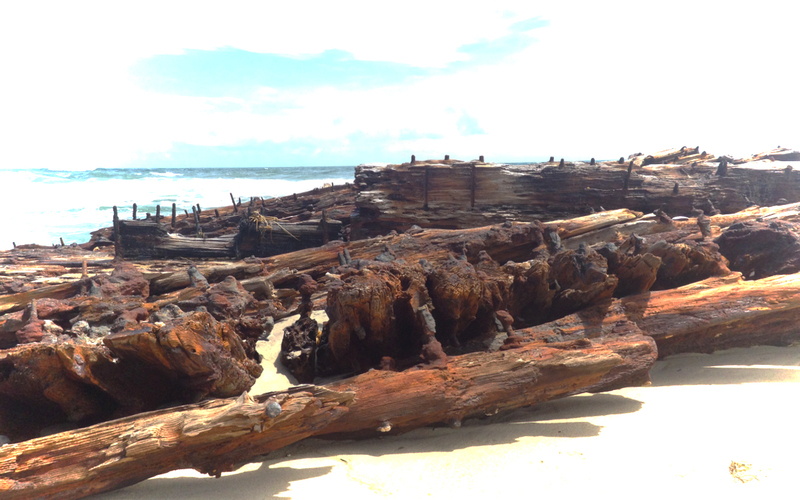 The potential of The Graveyard of the Atlantic was not lost on me at that moment, and I cannot begin to relate to the skill and bravery of those that navigated those waters before the advent of current technology. We arrived on Hatteras Island and began the 70 mile trek north towards the mainland, encountering on the way (with apologies to anyone interested in kite boarding) the most absurd scene of hundreds of kite boarders gathered for some kind of event. The vivid colors of that many large kites hovering off the coast was only surpassed by what I can only see as potential for tangling, beheading, drowning, and myriad other misfortunes that must be inevitable when so many people, tethered to hundreds of feet of cord each, are skimming across the water’s surface at high speed. 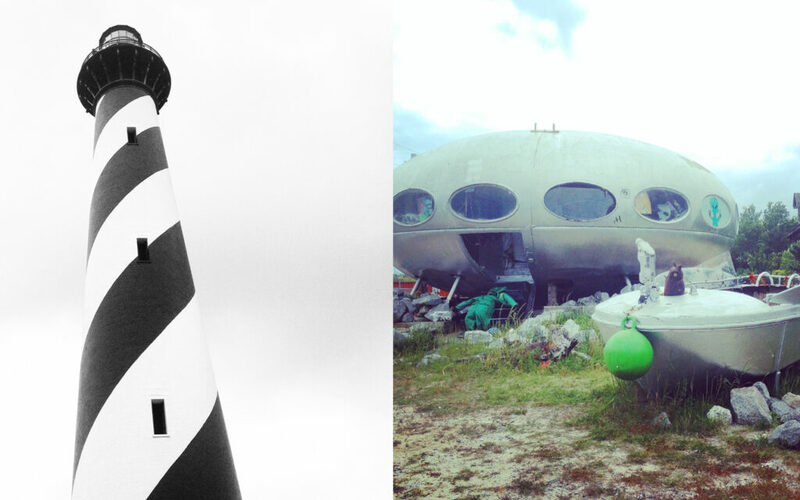 Also, we made a u turn to stop at what must have been a 50’s era modular home, repurposed into something of a UFO, complete with alien mannequins in flight suits, strings of landing (Christmas) lights, and a geocache. We blew through Nags Head, Kill Devil Hills, Kitty Hawk, and back onto the mainland moving towards Richmond. 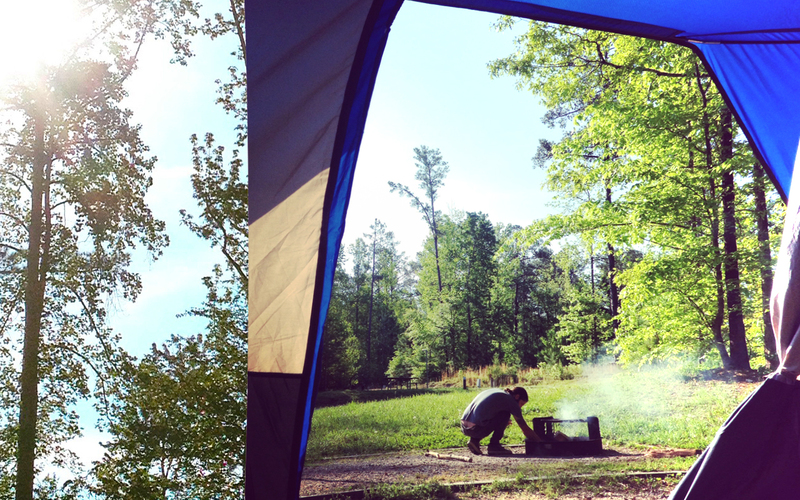 We arrived at a campsite in the Pocahontas State Park outside Richmond with just enough light to lay out camp. The next morning we were up early, made breakfast over the only open fire of our trip, and after a short look around the park were on our way. Five hundred miles and the New River Gorge lay between us and home. In typical fashion we managed to meander our way towards southern Ohio via a fairly direct but scenic route. Jumping off the freeway east of Clifton Forge, VA we made our first detour to check out the C&O Railway Heritage Center and weren’t back on 64 for more than a few miles when Renae discovered something called the Humpback Bridge, and it was decided this was something not to be missed. C&O Railway Heritage Center. Trains and stuff. Built in 1857 (after multiple structures in the location dating back to the 1820’s had failed) and the last remaining of its kind, the center of the bridge stands a good bit higher than the ends. It’s beautiful on the outside and graffiti covered within. Back on the 64 freeway and in short order we found ourselves overlooking the New River Gorge from a beautiful wayside hundreds of feet above the river and Sandstone Falls. This is where things went south. Renae trotted down the trail to see the falls while I stayed by the car while Townes napped. 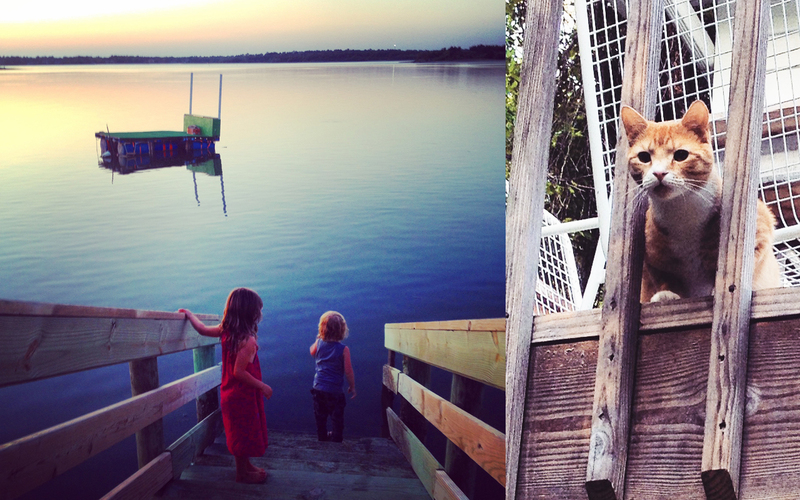 I stepped out of the car to take in the sights and shortly Townes was awake. I opened his door for a chat, leaving my coffee thermos on a stump where i’d been standing. We were miles down the highway before I realized my blunder and that is how I lost my trusty old cup. I’d owned that particular thermos since we lived in Chicago, something like 8 years. It had been smashed by the weight of a thirty three foot RV being lowered onto it, gone with me everywhere, worn to a perfect patina, and now is gone. I miss it. Ground to cover and failing light, we hightailed it out of the Gorge with southwestern Ohio a little less than three hundred miles off the bow. Nothing better than a good inventure, looking forward to another ramble down your way!